I never thought about the relationship between organics and renewables. This article sums it up pretty well. The site is a good site for for good news about renewables too. Organic farming methods help take carbon dioxide from the air and lock it in the soil – a process known as carbon sequestration. Our brainy friends at the Soil Association have calculated that if all UK farmland converted to organic farming, at least 3.2 million tonnes of carbon dioxide would be taken up by the soil each year. Organic farming and renewable energy go hand-in-hand, so we’re thrilled to be teaming up with the Soil Association to sponsor Organic September for the fourth year running. Go there and read it all. More next week. Cooking food. In the US that would not be considered either energy efficiency or even news. Yet for humans, cooking is totally necessary. In poor countries, it is a huge issue. This is good news. GANORA SHEIKH VILLAGE, India (AP) — Kamlesh feeds the flames of a crude clay cookstove with kindling, kerosene and sunbaked discs of cow dung. She breathes in the billowing smoke, as she does for hours every day. Her eyes water and sting. Her throat feels scratchy and sore. Kamlesh is one of hundreds of millions of Indian housewives who, with the simple act of cooking family meals, fill their homes every day with deadly airborne pollutants. The constant exposure to indoor air pollution kills some 4.3 million people every year across the world — 30 percent of them in India. The menace of cookstove pollution, which contains high concentrations of tiny particles known as black carbon, does not stop in the home. It compounds many environmental problems as well, from glacial melt to falling crop yields. India, the world’s third-largest climate polluting nation, has spent decades encouraging cleaner cooking technologies, with limited success. Such a shift would have little impact on India’s emissions of climate-warming greenhouse gases, and many of the alternatives pollute as well. Go there and read. It’s fascinating. More next week. But had I read this article before dealing with the problem in my basement I would have known to go straight for the water sources and not messed around with the other stuff I put outside on the porch or on the compost pile. But getting rid of that stuff did not hurt. I mean pancake mix that is two years old. Plant dubris that is months old and could act as food for the midges. So the energy saved in this case is MINE and that is important too. Non-biting midge flies or chironomids commonly occur in inland and coastal natural and man-made bodies of water. These midges are commonly known as “blind mosquitoes” because they are mosquito-like but do not bite. Midges are also called “fuzzy bills” because of the male’s bushy antennae. These aquatic insects are tolerant of a wide range of environmental conditions. Chironomid midges are found in swift moving streams, deep slow moving rivers, stagnant ditches, and in lakes and ponds that are rich in decomposing organic matter. The presence of certain chironomid midges is often used as an indicator of water quality.Bodies of water in urban and suburban areas are subjected to intensive human use through residential, recreational and agricultural activities. Through runoff, these ponds and lakes often become exceedingly rich in nutrients. Consequently, the variety of organisms in such habitats is usually low with just a few pollution tolerant species developing large populations. Some species of chironomid midges that are tolerant of low dissolved oxygen conditions often are a major component of the bottom invertebrate organisms of urban and suburban lakes, ponds and storm water retention ponds. Go there and read. Got the little bastards. More next week. But food poisoning is pretty common. Just think of the energy use on the farm. Huge machines powered by diesel gasoline, and huge energy consumption in fertilizers. We then transport the food huge distances. We sell them in huge stores oh keep the lights on at the local utility companies. Finally those of us in the first world drive it home in our and put it in our always on refrigerator. 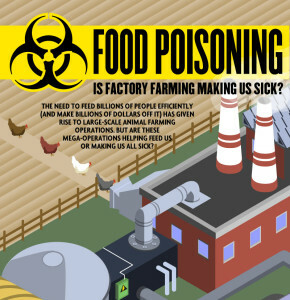 So the fact that we let this thing called food sicken us but also kills us is just inexcusable. This on top of what some of us throw away. Well here is a site thate has on the facts. Unfortunately it is done mostly in photographs and this blog has problems with pictures so go there and look. The population bomb was ticking, and apocalypse was next in line .??.??. Julian Simon, meanwhile, became a professor of business at the University of Illinois. In the late ’60s, he, too, worried about overpopulation; but a closer look at the issue led to a change of heart. He discovered that population growth and economic growth usually went together and that there was no evidence of food shortages. The chronic problem of American agriculture, in fact, was overproduction. Population was rising because fewer children were dying and life expectancy kept increasing. That was good news, surely. Quite apart from a decline in agonizing bereavements, said Simon, children once doomed but now destined to survive might go on to be the next Einstein or Beethoven. Simon also believed in the free market, whose long-term effect was to make products and raw materials not costlier and rarer but cheaper and more abundant. Occasional shortages stimulated increases in efficiency, the invention of better techniques, and the use of new materials. Irritated that Paul Ehrlich was making a fortune with his apocalyptic prophecies while he, Julian Simon, labored in obscurity, Simon issued a challenge in 1980: Let Ehrlich choose any five commodities and then watch their prices either rise or fall over the next decade. If the prices rose, Ehrlich would seem to be right about shortages; if the prices declined, Simon would seem to be right that things were becoming more plentiful. Ehrlich accepted the challenge and the two men agreed on $1,000 worth of five metals: copper, chromium, tungsten, nickel, and tin. They agreed that, 10 years later, the loser would mail a check to the winner for the difference above or below $1,000. The Chronicle of Higher Education called it “the scholarly wager of the decade,” and Ehrlich had some cause to feel confident. In the two recent oil crises of 1973 and 1979, gasoline prices had risen sharply while drivers fumed about shortages and long lines at the pump. Copper was in short supply and costlier every year. President Carter had donned a chunky sweater in the White House and ordered federal thermostats turned down to a chilly 65. Believing Ehrlich’s claim that the age of austerity was here to stay, the president had also commissioned the Global 2000 report, whose prognosis for the future was even grimmer than that of The Limits to Growth. OKOKOK this an example of bad journalism or AT LEAST cultural differences between 2 countries forms of journalism. Either way it made me slightly angry. If you read the article you will see that a fungus which is a really important food source but also a source of naturopathic medicines in Japan is at the heart of this article. (and yes, the disaster continues apace but the world has gotten tired of it and the Nuclear Power industry has wanted everything to die down) But if you actually read the article, the fungus is new and with great potential but it was discovered or at least the sample was taken in 2006 and the only connection to the Fukushima meltdowns is that the fungus is in a village closed to the public because of its proximity to the site and the mention comes at the END of the article. Now in the US, except in the tabloids, these kinds of headlines would not be allowed. But I guess any tie-in in Japan to something that is still roiling the country is allowed. The Yomiuri Shimbun A fungus found in the village of Iitate, Fukushima Prefecture, in 2006 is a new species, it has been learned. The fungus, named tsubugata-aritake, is a type of tochukaso, or caterpillar fungus, that grows and feeds on insects and is valued as an herbal remedy. The formal acknowledgment came as a German specialist journal on mycology carried a paper on the fungus earlier this month. Unlike other caterpillar fungus in Japan, tsubugata-aritake is a “takeover” type that feeds on insects such as ants and cicadas that have already been parasitized by another tochukaso, scientifically termed Ophiocordyceps sinensis. The Chinese and Tibetan caterpillar fungi that parasitizes larvae of ghost moths is well known as a Chinese medicine. According to the Japanese Society for Cordyceps Research, a society for caterpillar fungus researchers and enthusiasts, there are about 500 types of the fungi, 450 of which have been found in Japan, where research and studies on fungi are thriving and many new types have been discovered. In recent years, the caterpillar fungus has been attracting attention for use in health supplements. “If it has any medicinal benefits, I’d like to commercialize it and donate sales profits to reconstruction [of the prefecture],” said Yoshitaka Kaitsu, a pharmacist in Date in the prefecture who discovered the fungus. But the damage has already been done. The next question is what about next year. First, the seed corn was a total wash this year so right now they are trying to grow enough in Brazil to even get us going next year. But then the next question is when to plant and where. If anybody was a good enough predictor to get in during or right after the late frost then your corn would be fine and you would be sitting on a gold mine. This is contingent on us getting some moisture over the winter. If we don’t get enough moisture well then next year looks bleak. Flying into Des Moines, the corn fields look surprisingly green. America’s midwest produces half the world’s corn and Iowa its largest harvest, yet amid the worst drought in living memory all the untrained eye can see is the occasional brown mark, like a cigarette burn on the baize of a pool table. In Boone, Iowa, 30 miles away from the state capital, traffic backs up for miles bringing 200,000 people to Farm Progress, the US’s largest agricultural show one. Here, all the talk is of the drought. Pam Johnson, first vice-president of the National Corn Growers Association, says she can’t remember one as bad as this in her 40 years of farming. “My parents say you have to go back to the 1930s for anything comparable,” she says. In June, her farm in northern Iowa got an inch and a half of rain. “We usually get that a week. In July we got seven-tenths of an inch, for the month.” Rain may be coming soon, thanks to hurricane Isaac, but it’s too late for America’s corn crop. The US planted 97m acres of corn for this year’s crop – the most since 1937. If everything had gone according to plan, this year’s harvest would have produced a new record, at close to 15bn bushels of corn (a bushel is 24 million metric tonnes). It’s too early to say what the final tally will be, but the US department of agriculture has slashed its forecast to 10.8bn. Dan Basse, president of AgResources, an independent agriculture analyst, says that figure is likely to come down. “We’ve lost 4bn bushels of corn. That’s the largest loss in history, and we could lose another,” he says. The USDA has declared counties in 38 states to be “disaster areas”. About 72% of cattle areas are experiencing drought. Whatever. It is real rare that I do a Purely environmental post. Yes it is true if there is no food to eat, then there is no private housing market, thus no residential energy market. But man that is a stretch. Still fishing vessels use huge amounts of energy, at least the large commercial ones do, so they pollute the water as well as strip it bare. Between 1950 and 2006, the WWF report notes, the world’s annual fishing haul more than quadrupled, from 19 million tons to 87 million tons. New technology — from deep-sea trawling to long-lining — has helped the fishing industry harvest areas that were once inaccessible. But the growth of intensive fishing also means that larger and larger swaths of the ocean are in danger of being depleted. Daniel Pauly, a professor of fisheries at the University of British Columbia, has dubbed this situation “The End of Fish.” He points out that in the past 50 years, the populations of many large commercial fish such as bluefin tuna and cod have utterly collapsed, in some cases shrinking more than 90 percent (see the chart to the right). Indeed, there’s some evidence that we’ve already hit “peak fish.” World fish production seems to have reached its zenith back in the 1980s, when the global catch was higher than it is today. And, according to one recent study in the journal Science, commercial fish stocks are on pace for total “collapse” by 2048 — meaning that they’ll produce less than 10 percent of their peak catch. On the other hand, many of those fish-depleted areas will be overrun by jellyfish, which is good news for anyone who enjoys a good blob sandwich. Go there to see the graphs and maps and read. More tomorrow.